Now that installations of solar PV coupled with battery storage (solar+storage) are becoming more common in commercial markets, it is important that disadvantaged communities not be left behind. One of the reasons for this lag in market uptake of clean energy in low- and moderate-income (LMI) communities is a persistent financing gap. Current models of financing clean energy systems do not sufficiently serve low-income communities, if they serve them at all. Reasons for this include a lack of flexible capital and difficulty accessing tax equity markets. They also include nonprofit property owners being perceived by lenders as having limited borrowing capacity. As a result, solar+storage projects are vastly underrepresented in affordable housing and in critical community facilities across the country. The sad irony is that this lack of financing prevents the types of solar+storage projects that could reduce utility bills and create more resilient power systems for people who need the benefits the most – and who have been disproportionately impacted by heavily polluting energy sources. What is needed to overcome this financing gap and to deliver the benefits of resilient power to LMI markets? A focus for many community leaders has been to advocate for direct ownership of clean energy systems by low-income residents and the organizations that serve them. For good reason, ownership is a key equity issue for LMI advocates to pursue. The historical lack of ownership of energy assets by LMI communities leads to a compelling case for their future control and ownership of these resources so they can directly benefit from and participate in the clean energy economy. Direct ownership can provide the greatest control over a solar+storage system’s various value streams. These streams range from utility bill savings to potential revenue from grid services to backup power during grid disruptions. 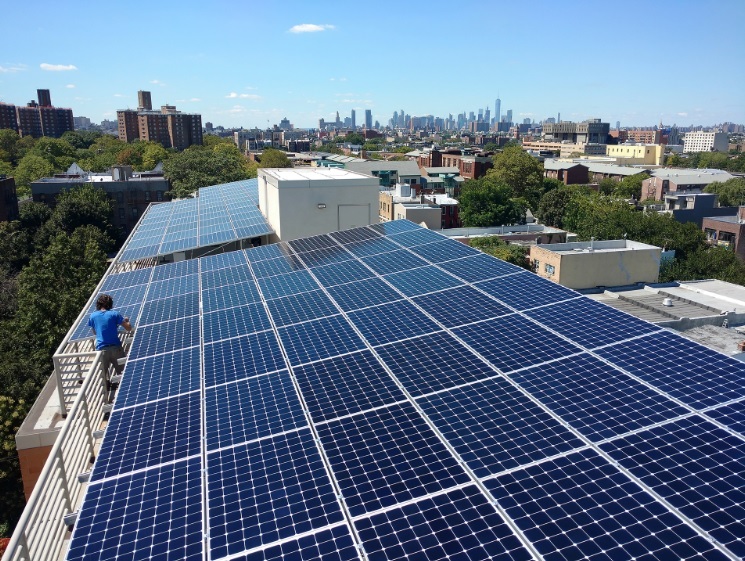 However, with these views and goals in mind, it is also wise to explore the full range of options available for communities to share in the equitable benefits of solar+storage systems. Toward that end, and with recognition of the potential risks and barriers facing the direct ownership approach, Clean Energy Group has written a new paper, “Owning the Benefits of Solar+Storage: New Ownership and Investment Models for Affordable Housing and Community Facilities.” It details additional ownership models that may represent good alternative approaches for some communities. Much of this paper is based on a counterintuitive assumption — that many of the most effective “ownership benefits” of solar+storage may be achieved through non-ownership models. The report starts with an examination of the immediate direct ownership model as a baseline and then explores alternative models. Immediate direct ownership: The solar+storage system is purchased and owned outright by the property owner. Third-party ownership flip: A third party initially owns the solar+storage assets until the tax equity investor’s tax incentives have been fully used, at which point ownership of the project assets flips to the property owner. Third-party ownership flip using an affiliated entity: The assets are transferred to an affiliated public-purpose entity instead of being transferred to the property owner/housing developer once the tax benefits have been fully used. C-PACE financing with third-party ownership: PACE financing secures the loan payments through a priority lien assessment on real estate property, providing third-party owners and/or tax equity investors with long-term financing for solar+storage projects. Utility ownership or third-party ownership under a utility-contracted payment-for-services agreement: The utility is indifferent to whether the project is located adjacent to an LMI community property as long as energy-demand congestion is relieved in key grid circuits. When the grid is down, the solar+storage system is available to provide resilient backup power for adjacent critical energy loads and public services. These options might or might not be preferable to immediate direct ownership, given the many circumstances that affect energy technology ownership and financing. These new avenues have not been fully tested in LMI markets with solar+storage projects. They are possibilities worth considering. Much more work is needed to put some of the new models into practice, including a review and reaction from the environmental justice community and others to ensure that these models expand rather than narrow the options for achieving the equitable benefits of solar+storage. To continue this conversation, Clean Energy Group is hosting a webinar on March 29 with speakers from the National Housing Trust and Urban Ingenuity. Rob Sanders is the senior finance director of Clean Energy Group. He analyzes, designs and promotes finance strategies to engage multifamily affordable-housing developers, municipal decision makers, and other energy-project developers in community resilient power. Lew Milford is president and founder of Clean Energy Group and Clean Energy States Alliance, two national nonprofit organizations that work with state, federal and international organizations to promote clean energy technology, policy, finance and innovation. He is also a nonresident senior fellow at the Brookings Institution. Join our LinkedIn group to discuss this article. You may also email the authors directly using our contact form.